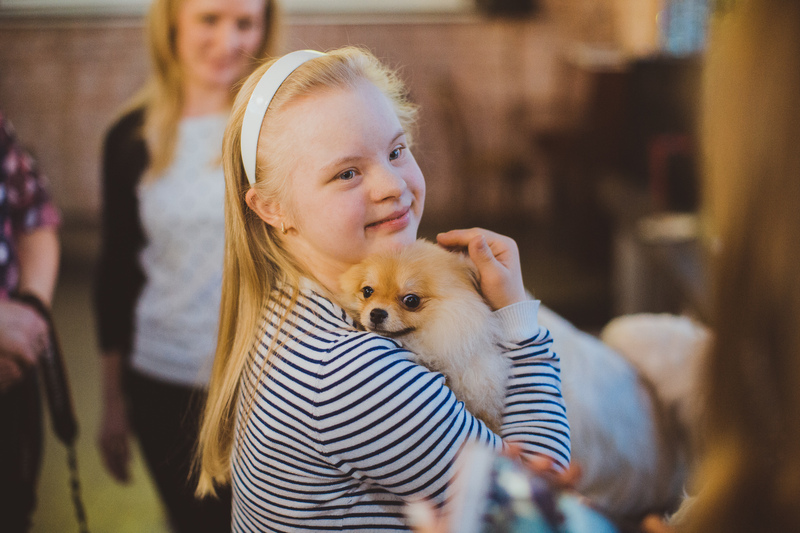 Four-footed colleagues and the career guidance program for people with Down syndrome | Downside UP Ltd. Downside Up Charity Fund and Mars Company represented by Pedigree Trademark did the first Russian research in the field of career guidance for people with Down syndrome. It allowed them to get basic knowledge about caring for dogs. The experiment started in May 2015 with the preparation stage up to November. It included 5 participants of the project to come twice a week to a canine centre and a hotel for dogs Hors located near Moscow. As animals feel more lonely being far from their masters, it is there where they need special care. The young people learned how to work, how to be responsible and independent when caring for dogs. Therefore this helped to find one solution for two problems. A specially designed program started with “the attentive adaptation”, when participants were supported by dog specialists and psychologists all the time, who also helped to control all stages of work. Then came the time for “the free adaptation”, when the young people got more freedom as they knew the animals, their needs and what they had to do. “17 years ago the main task for our fund was children with Down syndrome staying with their families, their education and socialization. There were so many parents who abandoned them as there didn`t know what to do with their baby. Today we need to go further and develop the possibilities for the realization of their personal potential in career and society”, -Irina Menshenina, Development Director says.